Lash), bedecked all in black spotting a flashy silver-studded gun belt. The resulting fan mail was overwhelming for Al. 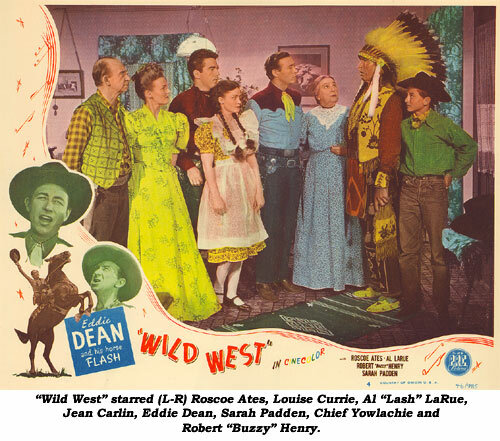 PRC featured LaRue in two more Cinecolor Eddie Dean starrers, “Caravan Trail” and “Wild West” before awarding Lash his own series in early ‘47 (WC #65, pg. 5). 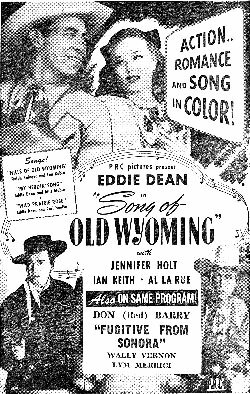 For “Song of Old Wyoming”, Eddie and newspaper woman Sarah Padden are pushing statehood for Wyoming territory in hopes of cleaning up the outlaw element. Needing assistance, the crooks send for an outlaw named The Cheyenne Kid (LaRue). Worming his way into the good graces of Padden and her friend Jennifer Holt, Cheyenne does all he can to break Padden’s bid for statehood, eventually having a change of heart when he learns he is Padden’s long lost son, only to stop an outlaw’s bullet in the final showdown. Eddie’s sidekick in his first two films was the grizzle-bearded, taffy-jointed, fumble-footed Emmett Lynn, later replaced by stuttering Roscoe “Soapy” Ates. “ROMANCE OF THE WEST” (‘46 PRC) Crooked town selectmen hire outlaws to run Chief Thunder Cloud and his peaceful Indians off their land so they can mine rich silver deposits. When a young orphaned Indian boy (Don Kay Reynolds) is killed by the renegades, Eddie Dean, the local Indian Agent reared by Thunder Cloud, and his sidekick Emmett Lynn bring gun justice to the killers. Reynolds soon played Little Beaver in Jim Bannon’s Red Ryder features. Definitely the weakest of Dean’s Cinecolor outings. 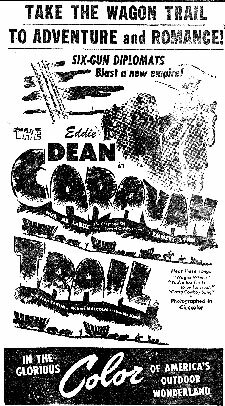 “CARAVAN TRAIL” (‘46 PRC) Dean is the “star” but Al LaRue and sidekick Charlie King absolutely steal the show from Eddie—who has to look to LaRue half the time for guidance. Eddie looks just plain lost at times! King is laugh-out-loud hilarious, especially when he complains about eating nothing but “rabbits, rabbits, rabbits!” Stunning Cinecolor adds greatly to one of producer/director Robert Emmett Tansey’s favorite plots about reformed outlaws (LaRue, King, Black Jack O’Shea) helping Marshal Dean (and deputy Emmett Lynn) clean up a corrupt town. A sub-plot involves LaRue’s years-long vengeance hunt for the man who killed his brother. Dean’s singing of “Wagon Wheels” will send a chill down your spine every time. There simply was no singing cowboy with a more thrilling voice. 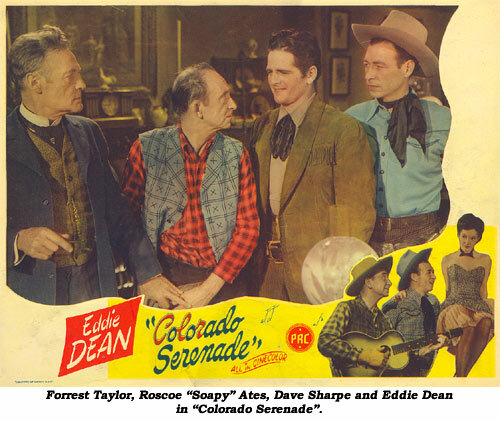 “COLORADO SERENADE” (‘46 PRC) Poor Eddie. After waiting years to get his own series he was upstaged and outgunned in popularity by upstart Lash LaRue. Producer/director Tansey gave LaRue his own series, leaving the way clear for Eddie, and now here comes David Sharpe (fresh back from WWII service) who, once again, steals “Colorado Serenade” from Eddie! Dean and Soapy (Roscoe Ates), bound for Rawhide, meet up with gunslick Sharpe, actually an undercover man for Judge Forrest Taylor who instigates himself into the outlaw gang. In a typical action packed Tansey finish, we learn crooked Warner Richmond revengefully stole Dennis Moore as a child to get even for Moore’s real father, Judge Taylor, convicting Richmond of a crime. Song highlight comes as Eddie, Ates, ranch hand Charlie King and the cook sing “Ridin’ Down to Rawhide”. Question is, who provided the “voices” for Ates, King and the cook? Possibly members of the Sunshine Boys who were prominent in several Dean westerns. “WILD WEST” (‘46 PRC) Eddie’s last in Cinecolor is easily his best from the rousing opening song, “Ride On the Tide of a Song”, to the conclusion—the wildest, free-wheeling action ending in B-westerndom. Arizona Rangers Eddie, Lash LaRue and Roscoe Ates are assigned to guard Lee Bennett’s stringing of the transcontinental telegraph. Town boss Terry Frost opposes the coming of the telegraph, fearing it will bring an end to his lawless activities. Eddie and Lash romance Sarah Padden’s two daughters, Louise Currie and Jean Carlin, and Eddie sings the plaintive “Journey’s End” to young Buzz Henry after Buzzy is wounded by outlaws. The musical Sunshine Boys are on hand (unbilled) as ranch hands. “DRIFTIN’ RIVER” (‘46 PRC) Outlaws realize with the coming of the railroad comes people—and law. So their concentration is bent on stopping the advancement of the iron horse. Government agents Dean and Ates are sent by the Cavalry to purchase horses for soldiers guarding the railroad. When Eddie agrees to buy rancher Shirley Patterson’s herd, a traitorous ranchhand spy tips off the gang’s boss, saloon owner Dennis Moore. Moore’s men steal the herd to prevent the sale, brutally ambush and murder a detachment of Cavalry and, later, gun down Patterson’s foreman, William Fawcett. Eddie gets in with the gang, posing as outlaw Whistlin’ Sam, and is about to make a round-up when the real Whistlin’ Sam happens by. Familiar plot is a remake of producer Tansey and screenwriter Frances Kavanaugh’s “Wild Horse Stampede” (‘43) w/Trail Blazers. Watch for Marion Carney (unbilled) as a saloon girl. Late in life Carney married veteran B-western heavy Terry Frost, and still later she was Lash LaRue’s 12th or 13th (who’s counting by now?) and last wife. 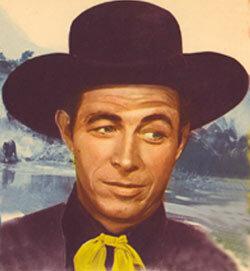 “TUMBLEWEED TRAIL” (‘46 PRC) Bob Duncan’s outlaws ambush and supposedly kill rancher Kermit Maynard. Duncan phonys-up Maynard’s will so his daughter, gorgeous Shirley Patterson and her young son are cut out and left nothing while Duncan, as Maynard’s worthless half-brother, inherits the ranch. When Shirley refuses to vacate the spread, Eddie and sidekick Ates ride to their rescue. PRC was trying to build a romantic team of Dean and Patterson; this was the second of three they made together. Patterson soon wed and left films for several years only to re-emerge in the mid-‘50s under the name Shawn Smith. This is a Frances Kavanaugh rewrite of her own “Riding the Sunset Trail” (‘41) w/Tom Keene. Director Robert Emmett Tansey’s direction seems more tired than usual, not helped much by the dull villainy of Duncan. 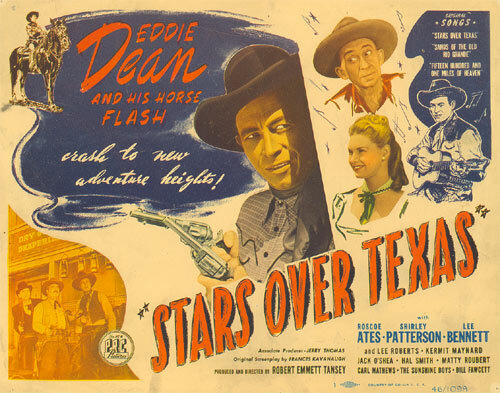 “STARS OVER TEXAS” (‘46 PRC) Jack O’Shea’s gang is trying to take over Shirley Patterson and brother Lee Roberts’ ranch. 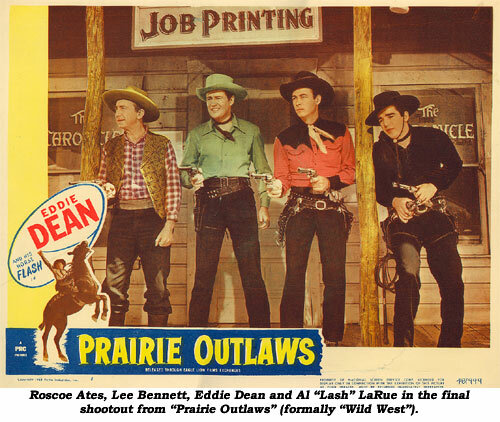 Lee’s old friends, Eddie, Ates and Lee Bennett (who is an exact double for Patterson’s crooked ranch foreman) join Shirley and Lee to round up O’Shea’s outlaws. Frances Kavanaugh’s script is a remake of her (and Bob Tansey’s) “Driftin’ Kid” (‘41) with Tom Keene. Cast as a peddler is Hal Smith who became well known as Otis Campbell, the Mayberry town drunk on TV’s “Andy Griffith Show” (‘61-‘66). “WILD COUNTRY” (‘47 PRC) Escaped killer I. Stanford Jolley is tracked by U. S. Marshal Dean and sidekick Ates. Jolley ties up with crooked saloon owner Douglas Fowley with plans to grab pretty Peggy Wynne’s ranch as a hideout. One humorous barroom sequence has Ates impersonating tough outlaw Jolley. Better than average villainy by Jolley and Fowley gives this routine Dean a lift. “RANGE BEYOND THE BLUE” (‘47 PRC) Someone’s out to bankrupt Helen Mowery’s stageline much B-western knowledge to figure out it’s her uncle, banker Ted Adams. Eddie and stuttering stringalong Ates, sort it all out. One interesting sequence has Ates capturing a sneezing hay fever plagued outlaw. But Eddie’s scheme to get in with the badmen is highly unbelievable, even for a B-western. Watch for George Turner, star of Republic’s “Son of Zorro” serial the same year, as a dog heavy henchman. Leading lady Mowery in her first western was beautiful and could act. She appeared in three other B-westerns with Charles Starrett and smaller roles in A-films before disappearing in ‘52. Where is she? “WEST TO GLORY” (‘47 PRC) Eddie and trail-kick Ates thwart three badmen from stealing a Spanish Don’s fabled Lopez diamond. One of the most original ideas in the history of B-westerns is a dream sequence in which Ates becomes the hero and Eddie is the goofy sidekick. It’s an hilarious idea, well executed. The one problem is, Eddie is almost “too good” at playing the sidekick! Ates (1895-1962) as Soapy, was a dopey faced stage and vaudeville comic prior to entering films in ‘29. He appeared in “Cimarron” in ‘31 as well as several Tom Keene RKO’s and various Republics before saddling up for 15 with Dean from ‘46-‘48. Eddie and the Sunshine Boys do a great western swing number, “Cry, Cry, Cry”. 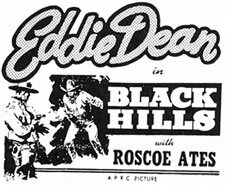 “BLACK HILLS” (‘47 PRC) As perfect an example of a mid ‘40s no-brainer Saturday afternoon singing cowboy B-western as you could possibly get. Simple plot—saloon owner Terry Frost and his gun hawks kill rancher Steve Clark for the gold mine on his property—plenty of fistfights (one of Dean’s best), gunplay, hard riding, chases, stage holdups, with three songs by Eddie, Andy Parker and the Plainsmen woven in as Eddie helps Clark’s daughter (beautiful Shirley Patterson) find her father’s killer. No thinking required, a Pepsi (or a Bud), some popcorn and this typical low budget PRC leaves your B-western appetite for thrills totally satiated. 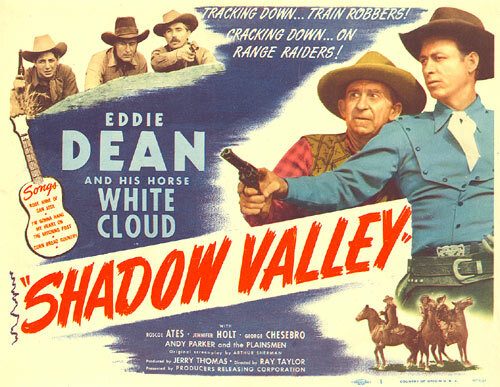 “SHADOW VALLEY” (‘47 PRC) Low energy Dean as he and Ates foil a scheme by suave lawyer George Chesebro to grab Jennifer Holt’s gold-rich land. Chesebro gets most of the screen time and looks as if he’s enjoying the villainy. Lane Bradford plays Jennifer’s ranch foreman. Off screen she and Lane were quite an “item”. Andy Parker and the Plainsmen are wasted as they’re only given a half a song to sing. Eddie calls Soapy his “sidekick”—a word you and I use but is seldom actually heard on screen. “CHECK YOUR GUNS” (‘48 PRC) Lean and tough, Joseph O’Donnell’s screenplay is all-out action as Ray Taylor directs with a surer hand than usual making this one of Eddie’s best. Plain and simple, there’s no law and order in Red Gap until Dean and Roscoe clean-out the bottom-dwelling element. Andy Parker and the Plainsmen sing and Eddie duets with pretty Nancy Gates. “TORNADO RANGE” (‘48 PRC) Nothing special but constant movement and action when U.S. Land Office agents Eddie and Roscoe investigate cattlemen who want to stem the influx of homesteaders whom they believe will destroy their land. The real fly in the ointment is crooked politician Terry Frost (and his gunmen, Lane Bradford and cold blooded killer Russell Arms). Arms went on to huge success as a singer himself on TV’s “Your Hit Parade” in the ‘50s. “WESTWARD TRAIL” (‘48 PRC) Coming at the end of Dean’s three year B-western career, this is standard, routine stuff—you’ve seen it all before as badman Bob Duncan tries to wrest control of leading lady Phyllis Planchard’s ranch because it has silver on it. Old pro director Ray Taylor does the best he can with a second stringer cast even by PRC standards. Andy Parker and the Plainsmen (unbilled) back up Eddie on one song. 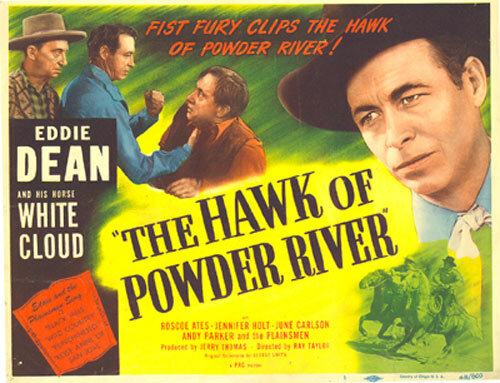 “HAWK OF POWDER RIVER” (‘48 PRC) One of Eddie Dean’s best even though it contains quite a bit of stock from previous episodes. Primary reason it stands out is due to Jennifer Holt’s charming but hateful portrayal of the Hawk—villainous leader of an outlaw gang terrorizing the area while masquerading as sweet Vivian on uncle Steve Clark’s ranch where she’s caching the loot. When Uncle Steve discovers the ruse, The Hawk’s heavies mercilessly kill him. Jennifer even plots with her crooked lawyer to murder Uncle Steve’s daughter, June Carlson, so the Hawk herself will have complete control of the ranch. All four of Eddie’s songs are recycled from previous films which causes the jarring effect of Eddie being seen riding two different horses! of which gobbles up about 13 minutes. 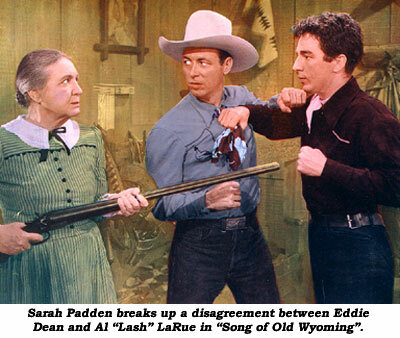 The remainder is Eddie, LaRue and Ates from “Wild West”. 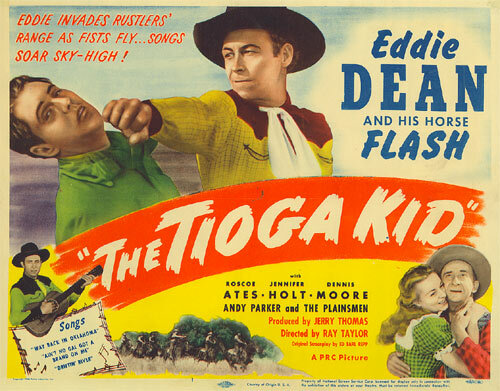 “TIOGA KID” (‘48 PRC) If you’ve seen Eddie’s “Driftin’ River” (‘46), you’ve seen 80% of this one. It’s reassembled and re-edited footage with about 15 min. of new story revolving around Dean look-alike badman, the Tioga Kid. Director Ray Taylor, who helmed several Eddie Dean titles, was an enthusiastic miniature train addict with seven miles of track and rolling stock inside his home.